The Archaeological Site of Olympia holds several masterpieces from the Ancient Greek world and was the site of the original Olympic Games. 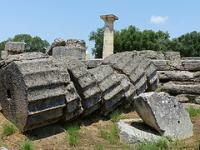 Already in the 10th century BC, Olympia became a center of worship to Zeus. It flourished until AD 426, the year in which the emperor Theodosius II closed all the ancient sanctuaries. Olympia now is mainly remembered for the games that were held here every 4 years. They existed even in prehistoric times, but got their pan-hellenic character in 776 BC. Victors won a crown with a branch of the olive tree that stood near the temple of Zeus. This archeological site is still quite intact. Well, the outlines at least are (not the buildings). At the center the Zeus temple. Around it the residence of priests, the training rooms facilities for the athletes, the guesthouses. Via a passageway, called the Crypt, you reach the stadium. 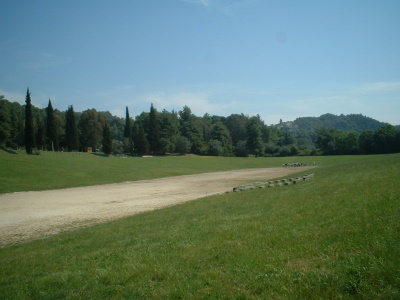 The place where the athletic games were held measured 212 x 28 meter. There were no seats, but the embankment could hold 45.000 spectators. In the nearby museum you can see a model of how Olympia looked like at its heydays. An amazing, bustling site it must have been: think of the athletes practising, but also the numerous spectators and officials that were around. Not unlike an Olympic Village nowadays, but on such small grounds. I find it fitting to write about Olympia in the days following the extinguishing of the Olympic flame for the 2018 Winter Games since I visited Olympia the day after the flame was lit last October. Sadly, there was no trace left of the ceremony, in which Greek women representing Vestal Virgins light the torch at the ruins of Olympia's Temple of Hera; by the time I arrived, the crowds had left and the Olympic torch was already en route to Athens, from where it would be flown to South Korea. 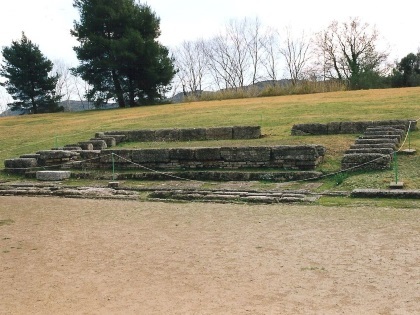 As other reviewers have noted, the archaeological site of Olympia is vast and replete with ruins of temples, a gymnasium, lodging, and baths, as well as an excellent museum. Most impressive is the Olympic stadium, where the ancient world's fastest men would compete for fame and glory. Perhaps the most well-known feature of the ancient games was the Olympic truce, which allowed athletes and spectators to travel to and from the games in safety. I'm a bit of a modern Olympics junkie, so I appreciated the opportunity to visit the original site of the games in advance of the 2018 Winter Olympics, in which the Olympic truce took on even greater meaning. Logistics: Olympia is a bit remote on the Pelopennese, but can be reached by private transportation or via trains and buses. Cruise ships offering tours of Olympia will dock at the port of Katakolo. I visited this WHS in June 2014. It's quite far from any other town or village, so this together with the fact that it was 39 degrees when I visited, must have kept the crowds at bay. From all the classical WHS I visited in Greece, this seemed to be the most vast and clearly distinguishable group of ruins. That said, what is left ruins but I found something interesting and different in almost every structure. The archaeological museum houses several ornaments, stone statues and bronze statues (most important is the winged Nike of Paionios) and it complements the archaeological site quite well. The main areas worth mentioning are the following: the Leonidaion and the Palestra (several lined doric columns in very good condition), massive ruins of the Temple of Hera and the Temple of Zeus with several inscriptions still visible, the workshop and thermal baths where there are excellent mosaic floors visible and marble carvings, and finally the impressive Ancient Olympic Stadium with an intact arched entrance and start and finish lines visible. I must say this is one of my favourite WHS in Greece. We arrived by boat in Katalokon and since we missed a bus we rented a car at the port and drove quite easily to Olympia in about half an hour. Arriving there around one thirty we were amazed to learn that the museum closed at 3pm and the archaeologic site at 4! This left us very little, too little time in the museum. It displays first class art works, among them the famous Hermes statue by Praxiteles and impressive groups of statues that one crowned the tympanon of the temple of Zeus. But I was most taken by the incredibly refined metal works, among them many Griffins. The museum has also many good notes about the history of the place and in three languages! This is something I have missed in many WCTs! All in all it would be worth to spend a couple of hours in the museum. The archaeologic site was also surprisingly impressive: Despite the fact that there are only ruins, the vastness of the place and its architectonical arrangement can be felt very excellently as you walk through it. Very touching to see the base of the great temple of Zeus which was home to the statue of Phidias, one of the seven wonders! Very nice also the pavilion-like Phillipeum, das Alexander the Great built for his father. This is probably the incarnation of the romanticism for ruins in the 19th century. During our visit the abundance of blossoming trees (some of them historically clearly incorrect since the grew in the middle of a house) contributed strongly to charm of the site. The best experience of this site was on August 2004 during the Athens Olympic Games. The connection between the modern and the ancient games. I woud love to see the famous statue of Hermes to the page. Is oviously one of the main reasons to visit Archea Olympia. Definitely a must-see for anybody even slightly interested in Antiquity. Continuing my Greek journey from Athens and Delphi, I hopped on the narrow-gauge train in Corinth reaching the end station of Olympia a couple of hours later. Finding my way between the few spots of shadow, hiding from an almost torturing sun, shining over the modern village of Olympia I soon found my way to my hotel. I must say that I quickly got to like this little village that was now resting in the afternoon heat. Good food and a relaxing atmosphere is paired with unfortunately too many souvenir shops catering to the busy day-visitors from Athens that comes at lunch and leaves a couple of hours later. But Olympia definitely deserves a better destiny. Why not stay here for a night and enjoy. Then you will also get another upside - to visit the ancient Olympia in the early morning when the tourists have not yet arrived. Wondering around the overthrown columns all alone, pass the bath houses and the wrestling schools through to the stadium quickly takes you to another world. And don't forget the excellent museum, conveniently located nearby, provides you with an insight in the life of sports during the 700 years Olympia functioned as an annual meeting point. 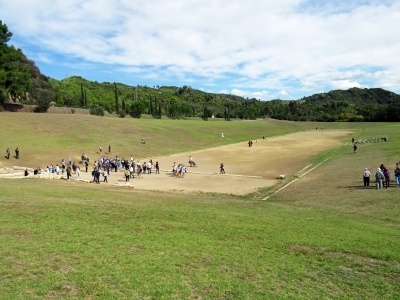 The ruins of Olympia contain their fair share of Temples etc but THE place to go to is the Stadium where the ancient Games were held (photo). There you can still see the start and finish lines, 1 “Stadion” apart” – the latter is closest in the photo. On the right, half way down, was the judges’ enclosure. The location at each end, of the “cippi”, columns for running round in multi-“lap” races, can also be seen. Another point of interest, just before what was a covered passage leading into the stadium (entrance at bottom left of photo), are the pedestals where the statues of Zeus, paid for by the fines of those caught cheating, were placed! The Games were still held through to the Roman era (In fact, they continued into Byzantine times until 394CE) and Nero, an avid charioteer, went to Olympia to take part in the 211th Olympiad in 67CE. He was, perhaps wisely, allowed to win despite falling off! 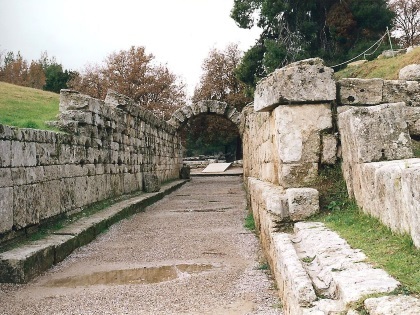 The race course, originally to the right of the Stadium, was destroyed in floods from the nearby river Alpheios and there is nothing to see (To see a reasonably complete Hippodrome go to Tyre instead – see my review). Emperor Nero: "Nero was convinced to participate in the Olympic Games of 67 in order to improve relations with Greece and display Roman dominance. As a competitor, Nero raced a ten-horse chariot and nearly died after being thrown from it He also performed as an actor and a singer. Though Nero faltered in his racing (in one case, dropping out entirely before the end) and acting competitions, he won these crowns nevertheless and paraded them when he returned to Rome. The victories are attributed to Nero bribing the judges and his status as emperor"